March 2012 The days are finally getting longer and it’s a real treat to drive back and forth to work in daylight. Spring is getting closer by the minute! Many gardens around town have spring bulbs peeking up already and I can hardly wait to see my crocuses again. Were you able to attend our General Meeting on February 16th? 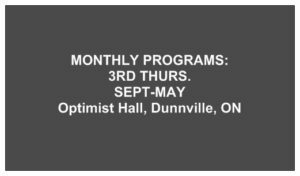 If so you were able to see our wonderful new venue, the Dunnville Optimist Hall. There is so much more space. It’s easier to access (no stairs) and the tables are always set up so there is less time spent setting up and putting away. Soon we will have DHS signs posted outside on the building. 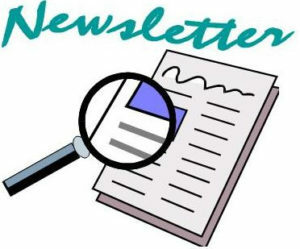 Please take a moment to look at our website, especially the “Upcoming” and “Agenda” sections. We are going to have a booth at the Dunnville Home & Garden Show in April, and we are hosting a plant sale in May. Please plan to attend, as I know these events are a lot of fun. A bus trip to Canada Blooms has been arranged for Saturday March 24th. The bus leaves Dunnville at 8:30 a.m. and returns at approximately 6:30 p.m. The cost of the trip is $40 for DHS members and $50 for non-members. Non-members will be issued a membership for insurance purposes. The ticket will include your bus trip and admission to Canada Blooms. This also covers admission to the National Home Show, which is on at the same time at the same location. Please contact Debbie Thomas at (905) 774-3064 if you wish to purchase tickets. Tickets are being sold on a first come first served basis. Please call early so you won’t be disappointed. Do you order seeds from a catalogue? Vesey’s Seed House is now advertising that it is time to order pepper seeds. They have a great website at http://www.veseys.com They have a great inventory of bird feeders and gardening supplies as well. Karin Vermeer from Vermeer’s Garden Centre in Welland is our guest speaker for this month. She is going to teach us about therapeutic horticulture. It should prove to be an interesting evening. Our March meeting is scheduled for Thursday, March 15th at 7:00 p.m.
Garden Tip for March: Weeds: Once the weeds in your garden go to seed you can be fighting that weed seed for up to 7 years or more (dandelions are notorious for the seven year seed life). Most weeds can be simply pulled or cultivated out of the garden while they are young. If you know you can count on several sunny days, Roundup is a good product to apply. It is still available in Ontario and after 7 days is no more toxic than table salt. The leaves of the weed carry Roundup directly to the roots thus killing the entire plant. It doesn’t leach through the soil. If you don’t want to use Roundup then old-fashioned “elbow grease” will work. March is also a good time to clean out your birdhouses. Even though the rent is free, the birds are fussy. Sue Mazi, DHS Corresponding Secretary. Meeting was opened by Judy Jeffery at 7:10 p.m. 44 members signed in. Minutes from November 2011 were read by Sue Mazi. Sue moved to have them accepted as read, and Linda Muldoon seconded the motion. All were in favour. Mail: There was no new mail. Kim Christoff read the Treasurer’s report for February 2012. We have 54 paid up member to date. Judy announced that Maura had refreshments that were ready and rather than wait until later in the program advised that we should partake early. A short break was taken. Maura did such an awesome job preparing goodies and having hot tea and coffee for everyone. Thanks to all who volunteered to assist her in the kitchen. Susan Lusted, OHA director for District 9, gave a power point presentation regarding the OHA convention that is being held in Niagara-on-the-Lake on August 17-19th. This year’s theme is the War of 1812 Bicentennial. OHA is looking for volunteers to assist in all aspects of the convention. A signup sheet was passed around and one was left with us if anyone should decide in the near future to sign up. Kim spoke about the upcoming Lion’s Club Home Show in April. We need gifts to hand out, such as seed packets. Last year we handed out 1000 bulbs, but we don’t have access to them this year. Any ideas? The show is 4 weeks away. The show will be held at the new Dunnville Memorial Arena on April 20 & 21st. Maura handed out another volunteer sheet for kitchen duty. We have just about all the meetings covered. We still need helpers for May 17th (1) and Sept. 20th (2). Thank you to everyone who signed up to help. Tickets will be available at the April meeting which is the night before the home show. We have a beautiful arbour to give away as 1st prize, and a garden bench for 2nd prize. Thank you to Rob Maracle for securing these items for us. Thanks to all the volunteers who have signed up to man the booth at the Home Show. Debbie Thomas spoke about the upcoming bus trip to Canada Blooms on March 24th. There are 12 tickets left. We are leaving at 8:30 a.m. sharp from the condos located at the bridge. It is going to be a fun day with games and prizes on the bus, and with Canada Blooms and the National Home Show co-located it promises to be a wonderful show. Our guest speaker for the evening was Karin Vermeer. She taught us about therapeutic horticulture and how it is used to help people with physical and cognitive difficulties. It sounds amazing. She also brought numerous plants and gave a demonstration on how to assemble baskets and planters for outdoors. The plants and planters that she made were offered for sale. Thank you, Karin, for sharing your vast knowledge about plants and the wonderful things that can be achieved using them. Ways & Means draw raised $59.00. Betty always does a great job. Meeting was adjourned at 9:10 p.m.